The manganese bath is most commonly used in pediatric practice with diathesis, neurodermatitis and other skin diseases associated with pustular lesions and accompanied by itching. However, the antiseptic action of potassium permanganate is used in adults for General and local baths, lotions and washes, and first aid. Before you take a bath with potassium permanganate, prepare its solution in advance, as contact with undissolved crystals of manganese can cause skin burns. Depending on the destination, make the necessary concentration of a solution of potassium permanganate. For the preparation of manganese solution for the bath, add warm water and a few grains of the drug and mix thoroughly. Bring it to a saturated color – the color of red wine. Wait until the permanganate is completely dissolved or undissolved particles will settle to the bottom. And only then slowly add it to your bath water to have a uniform light pink color. With such a bath concentration of potassium permanganate has an astringent, drying and disinfecting effect. And is used to treat skin diseases, accompanied by purulent lesions and in the treatment of burns. It suppresses propagation of harmful bacteria and forms the skin protective film. Take a bath with potassium permanganate in a day no more than 15 minutes (children 5-8 minutes). The course of treatment manganese bath is up to 10 times. After the bath take a shower (if a bath is child rinse his 2-3 litres of water). 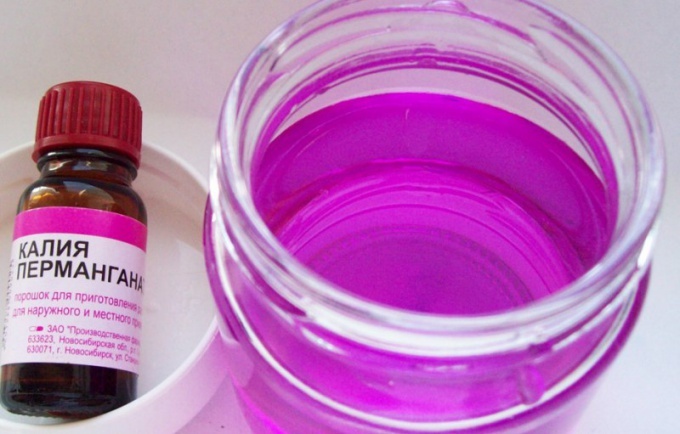 Bites of tarantula, black widow and other poisonous insects make a lotion or bath with a more concentrated solution of potassium permanganate. Dilute it in the same sequence as above, but in the tub add solution in larger quantities to get a more intense color of the water. Also, be careful not to damage the undissolved crystals the skin. For gastric lavage in case of poisoning, for irrigation during urological problems and hemorrhoids use light pink solution of potassium permanganate, diluted in advance and then added to water for washing. For lotions for ulcers and burns, use a saturated solution of potassium permanganate, and for cauterization of wounds – concentrated.